This Crème Egg Easter pimp is dedicated to my gorgeous husband who loves snacks (and particularly massive pimped ones) almost as much as he loves me! Some more chocolate (about another 240g) because the first bar is blatantly not enough! Unwrap Easter egg and carefully split the halves – fortunately ours weren’t well stuck so no problems there. 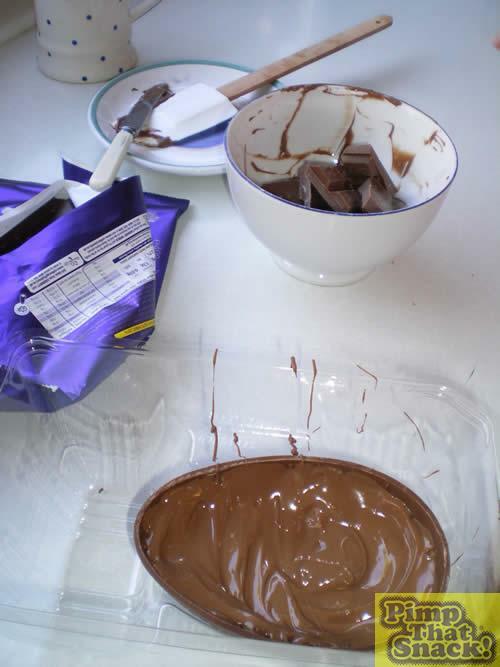 Melt some chocolate in the microwave and start filling one of the halves. We used the packaging from the Easter egg to hold the shell in place as we did it. 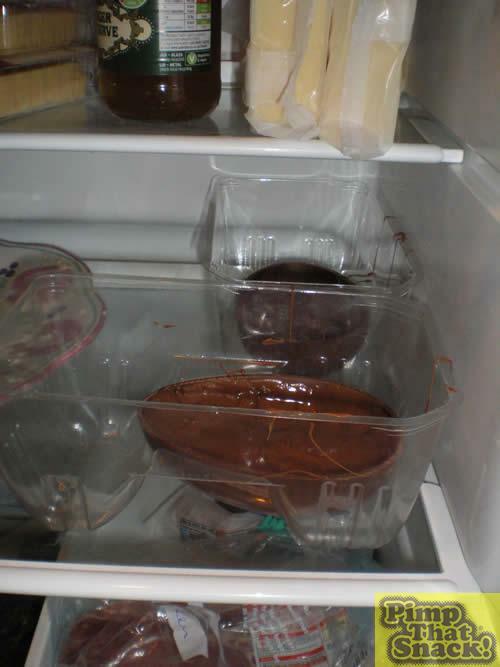 We also had put the halves in the freezer for a little while beforehand but we’re not sure if this made a difference or not....because shortly afterwards the first half cracked and the molten choc spilled forth! This half was sacrificed to the cause and melted down to make the filling for the next half. 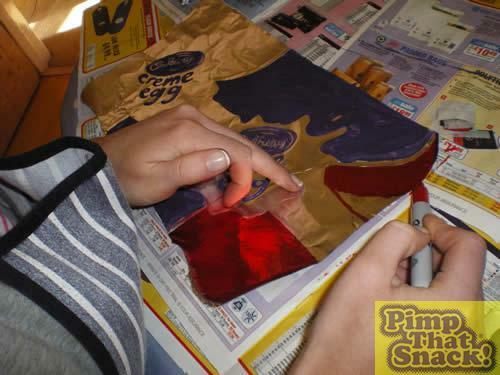 Unwrap another Easter egg and repeat Step 1! Fill both halves to about 3/4 full. Leave to set in the fridge. 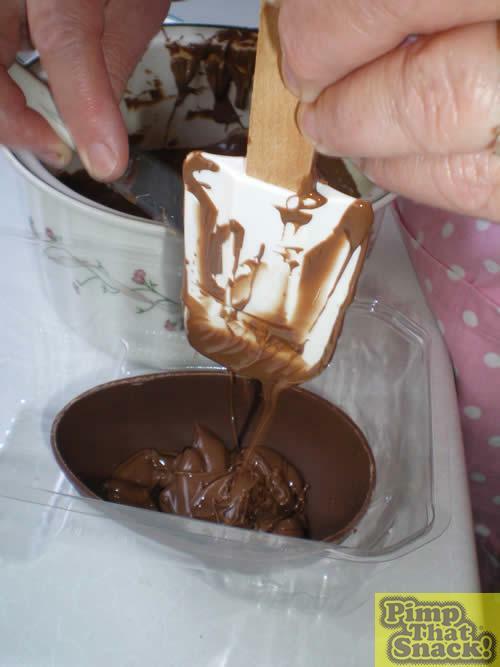 Melt some more chocolate and start topping up one of the halves. With some room to spare, embed a Crème Egg into the middle of the chocolate until it’s half-submerged (careful it doesn’t sink completely!). This will constitute the fondant centre of the egg...okay so the chocolate-to-fondant ratio is a bit off but have you seen how complicated it is to make fondant from scratch!!! 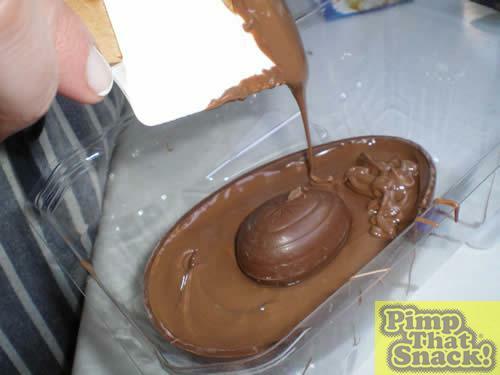 Fill up the half to the rim with more melted chocolate. Return to the fridge. Repeat Step 3 with the other half but without the Crème Egg bit. 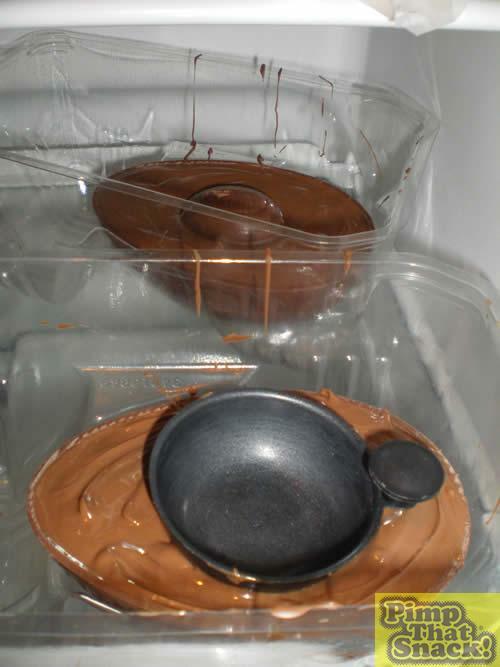 To make sure there’s enough room for the other half of the Crème Egg centre find an object to push into the melted chocolate whilst it sets. Preferably this should be some kind of basin shaped object. Mum located a poached egg cup from the poached egg making pan that was just the job! Return to the fridge. Whilst the chocolate was setting I got to work on the wrapping. First I had to return to our house from my mum’s to pick up the paints and markers that I forgot to bring over in the first place. 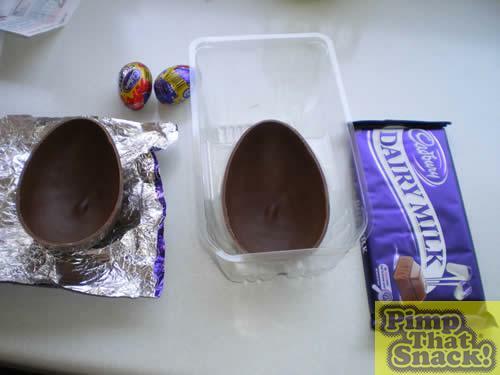 Once back at mum’s, I cut a piece of foil using the original Easter egg wrapping as a guide for size. Copy the design from a Crème Egg wrapper and etch using a pointed object onto the foil (not too pointy though because you’ll cut the foil! Doh!). You’ll need patience for this if you’re a bit of a perfectionist like me and want to get it right. I had to mix paint to get just the right colour purple and give it a couple of coats until it looked like the real thing. I’m particularly proud of this bit!